Stepping completely away from WW I (see all the postings below) or other day-to-day concerns, I spent a wonderful 90 minutes last night watching Particle Fever, a 2013 documentary about the Large Hadron Collider at CERN Switzerland as, after 30 years of planning and construction, it is fired up for the first and following a melt-down and repair, a subsequent time, . 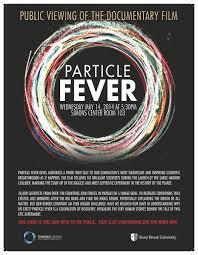 If you have a scintilla of curiosity about what the heck the LHC is, or the Higgs Boson, or a multiverse this is a great place to begin. You won’t get deep physics but you’ll meet some engaging physicists talking about why they are excited — and worried– about the results of the proton smashing in this five story wonder of human engineering. You’ll be gripped with the same excitement you see in a room full of otherwise not too excitable geeks and get a handle on why the results –the appearance of the elusive Higgs Boson, predicted by theory but never before seen– are related to the stand-off between the multiverse vs the supersymmetry theories of the universe, and what the answer means about where we came from, where we’re going, and if going with anyone else…. Peter Higgs, who first theorized the necessity of such a particle, was in attendance. His emotion, and the standing ovation he gets from his peers, at the results of the first experiment, are something you’ll be glad to share in. Here are some on-line comments. Ignore the sourpusses and watch the film. It is not a physics documentary, it is a documentary about physicists at the edges of theory and practice behaving like others do watching their kids win a soccer game. Added to our pleasure is the diversity of people involved — several women, including at the top, Greek, Iranian, Jewish North Americans, 100 nationalities involved in one way or another. Just a little bit of feel-good. Yep. We need some. And 95% like it at Rotten Tomatoes.